Each year as the leaves come down we can regard them as a nuisance or as a great gift of organic matter that benefit our landscapes. The Xerces Society’s new campaign Leave the Leaves articulates the benefits of leaves for our insect friends—check it out:https://xerces.org/2017/10/06/leave-the-leaves/ . 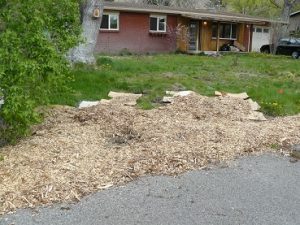 Or, if this is the year you have decided to kill some of your lawn, collect your neighbor’s unwanted leaves, put down a base layer of overlapping cardboard or heavy paper and pile the leaves on top. Plant into the mulch next spring.